It hasn't been all that long since our last panettone review. And since that review was posted two months ago, it has come to my attention that panettone bread makes excellent French toast. I had no idea. 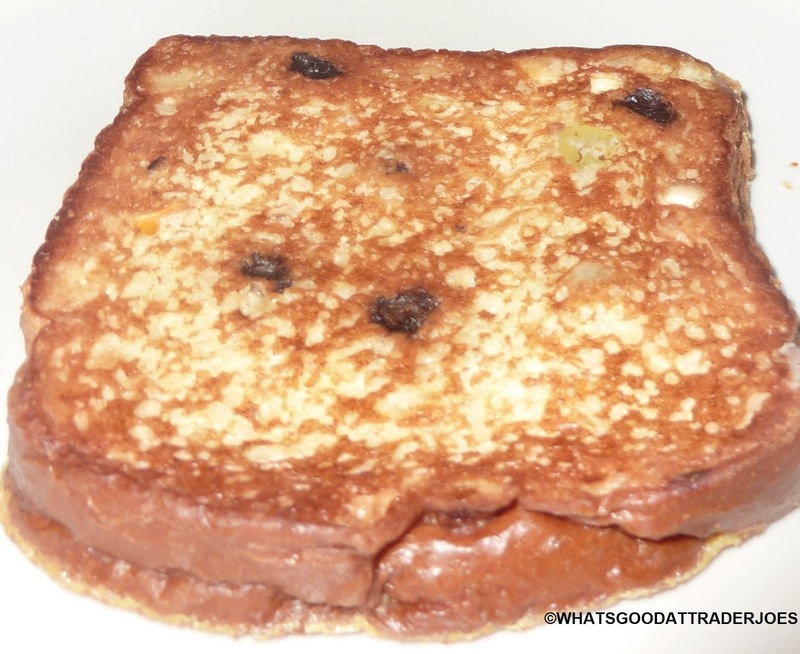 In fact, a reader commented and asked if I thought it would make good French toast. At the time, I said my admittedly not-so-confident guess was no. That just goes to show you that my culinary instincts are still solidly in the "foodie-hack" category and have not evolved far beyond that at this point in our Trader Joe's food product rating adventure. 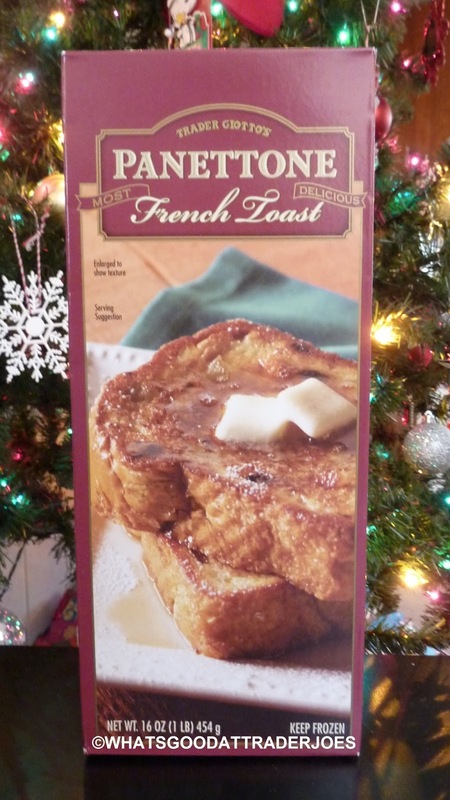 Other readers posted comments on this blog as well as the Facebook page that the product did, in fact, make excellent French toast. I was curious about trying to make it myself, however, doing that would have involved cooking. There would have been eggshells all through my eggy bread. Sonia does enough around here, so I didn't try to twist her arm into making it for me, although the idea crossed my mind on more than one occasion. Also since that Pumpkin Panettone review, I was made aware that we had been pronouncing "panettone" wrong the whole time. You're actually supposed to pronounce the "e" at the end, kind of like in the word "minestrone." Those zany Italianos. In the Panettone Classico review, I wrote a terza rima love poem to the product. I took great pride in the fact that my rhyme and meter was nearly perfect, but now that I know there's an extra syllable in the word "panettone," my iambic pentameter is completely ruined. But let's get back to the product at hand, shall we? Because it's excellent. I like it better than any other French toast or panettone product I've had from Trader Joe's. We followed some advice that Sonia found online and heated it in the microwave, melted a nice dollop of butter on each slice, and dusted with confectioner's sugar. It's convenient and simple...and amazingly delicious. The toast slices are vastly more practical than the bizarre, though presumably more traditional, bell shapes we've seen in the other two panettone products. And I always thought Trader Joe's French Toast lacked a special zip. Well, the raisins and citrus peels in this panettone version were apparently exactly what it needed, because they blended surprisingly well with the egg and bread flavors here. Sonia and I both agree this is a "two-thumbs-up" product. She thinks the egg batter really makes the panettone bread more palatable, not that she had any major problems with the non-French toast versions. If you were hesitant to try the actual Panettone Classico or Pumpkin Panettone, this product is a great "gateway" food into the world of the festive Italian candied fruit cake. Four stars from Sonia. A near-perfect four and a half from me. Geniuses! Pumpkin panettone should be next! Or something different type of pannetone. Cookie butter panettone??? Get it on TJ's!!! Or cookie butter French toast!